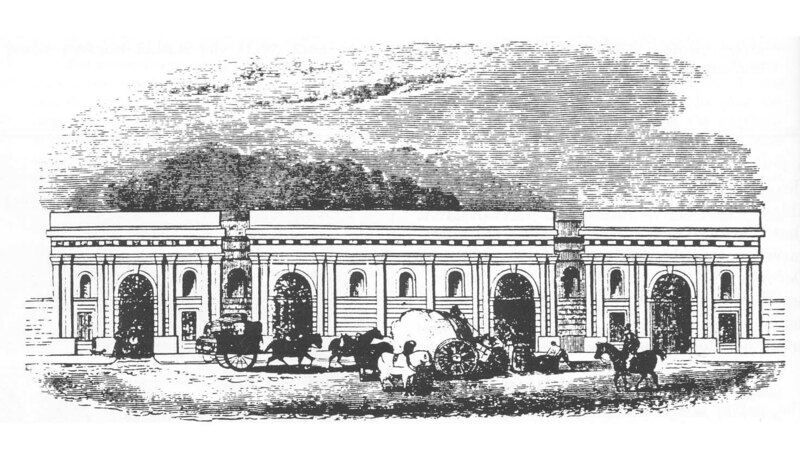 A lithograph showing Joseph Franklin's Curzon Street frontage to the Grand Junction Railway's station. The main central section of the Curzon Street entrance screen wall consisted of four large Roman arched doorways, set in a wall interspersed with pilasters, and niches under a deep cornice and parapet. The wall had a dressed stone plinth and parapet while the remainder, including the pilasters, was finished in stucco. Because of the direction of Curzon Street, the screen (which was parallel with the street) stood at a sharp angle to the station, giving it a somewhat strange appearance and layout. The station was broadly similar to Lime Street station but although the frontage was distinctive it could not compete in quality or appearance with the L & B station just next door.